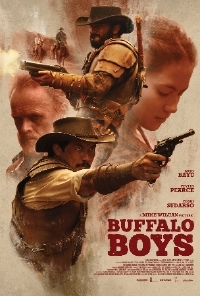 Today, Goldwyn Meyer released Indonesian western (and Singapore's submission for the Oscars' "Best Foreign-Language Film category), Buffalo Boys on Digital platforms, OnDemand and in select theaters. The internationally produced, 19th century martial-arts western was directed by Mike Wiluan (also a co-producer on Crazy Rich Asians) and co-written with Raymond Lee and Rayya Markarim. It premiered at the Fantasian Film Festival last year in Montreal. Buffalo Boys stars Yoshi Sudarso (TV's "Power Rangers: Dino Chargo" and "Pretty Boys"), Ario Bayu (Java Heat), Pevita Pearce (The Sinking of Van Der Wijck), Tio Pakusadewo (Letters from Prague), Conan Stevens (The Hobbit), and Reinout Bussemaker (Flight HS13).